Four classic Mercedes Benz 300 cars (two Roadsters, a Gullwing and an Sc) are on offer at the Gooding Scottsdale 2019 classic car auction. 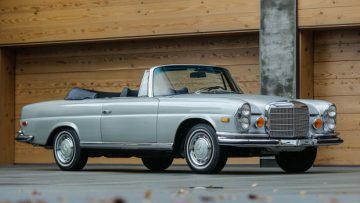 Gooding announced several high-end classic Mercedes Benz cars for its annual Scottsdale, Arizona, sale in January 2019. A rare 1963 Mercedes-Benz 300 SL Roadster (Estimate: $1,750,000 – $2,250,000) with only 16,000 miles on the clock is the most-expensive car in this group but top provenance comes with the 1955 Mercedes-Benz 300 SL Gullwing (Estimate: $1,100,000 – $1,400,000) that originally belonged to famed Berliner Philharmoniker conductor Herbert von Karajan. The second 1957 Mercedes-Benz 300 SL Roadster (Estimate: $900,000 – $1,200,000) may be a steal if it goes for below a million dollar while the 1956 Mercedes-Benz 300 Sc Roadster (Estimate: $900,000 – $1,300,000) is actually the rarest (only 53 produced) and most comfortable of the bunch. 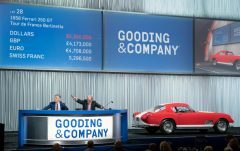 Gooding & Co scheduled its 12th annual Scottsdale classic car auction on January 18 & 19, 2019, at the Scottsdale Fashion Square, in Scottsdale, Arizona, USA. In 2019, Gooding earned $48 million by selling 105 of the 124 lots on offer for a sell-through rate of 85% and an average price of $459,417 per car. In 2018, Gooding earned $49.2 million in Scottsdale by selling 110 out of 129 cars offered – a sell-through rate of 85% and an average price of $447,415. In 2017, Gooding gained $33.4 million at the Scottsdale auction by selling 106 of the 126 lots on offer – a good 84% sell-through rate. In 2016, Gooding grossed $43 million from 113 cars and in 2015 it achieved $51.5 million from 126 cars on offer. 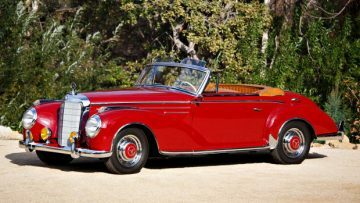 Gooding announced several classic Mercedes Benz 300 cars for the 2019 Scottsdale classic car auction. Most popular are the 300 SL Gullwing and Roadsters from the 1950s while a couple of large cabriolets will also attract much attention. The ultra-rare 1963 Mercedes-Benz 300 SL Roadster (Estimate: $1,750,000 – $2,250,000) is one of only 210 final examples built with the desirable alloy-block engine and disc brakes. The car has traveled less than 16,000 miles and has had just three owners since new; very few 300 SL Roadsters can boast these attributes. Finished in a beautiful shade of white over its original red leather upholstery, this 300 SL has the optional Nardi steering wheel, and is also equipped with an original set of red Karl Baisch luggage and optional hardtop. With a majority of the remaining great alloy block roadsters residing in permanent collections and not likely to change hands in the foreseeable future, this truly outstanding example is worthy of serious consideration. 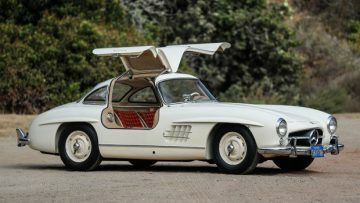 The wonderfully preserved 1955 Mercedes-Benz 300 SL Gullwing (Estimate: $1,100,000 – $1,400,000) was recently discovered in a Northern California garage where it had been kept out of the public eye for decades. It was sold new to famed Austrian conductor and passionate car enthusiast Herbert von Karajan, who famously lead the Berliner Philharmoniker for decades. He ordered the Mercedes with a very rare and unusual specification – it is finished in Weissgrau (DB 158) with tan vinyl upholstery with red plaid fabric inserts. Most importantly, the car was ordered with Rudge knock off wheels – a very rare and desirable option for the 300 SL. According to Hagerty, Rudge wheels add around $50,000 to the value of a Gullwing (and $100,000 to a Roadster). This is undoubtedly a wonderfully optioned Gullwing, with distinguished provenance that is confirmed by its factory build record, that has never been presented before at public auction. The most covetable and collectible model of the W188 series is undoubtedly the 300 Sc Roadster presented here. Only 53 Sc Roadsters were ever built making the car far scarcer than the more famed Gullwing or SL Roadster – new the Sc was more expensive than the Gullwing. The Sc Roadster, in contrast to the Cabriolet, featured fold flat top that disappeared completely into the coachwork, under a simple leather boot. 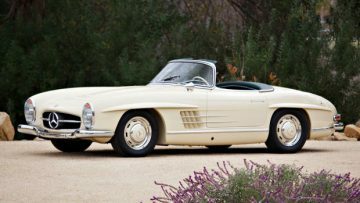 In 1997, this 1956 Mercedes-Benz 300 Sc Roadster (Estimate: $900,000 – $1,300,000) was treated to a five-year, concours restoration by renowned specialist Don Mertz of Sun Valley, California. The car is presented in a superb combination of Dark Red over a Cognac leather interior and fitted with a matching luggage set. 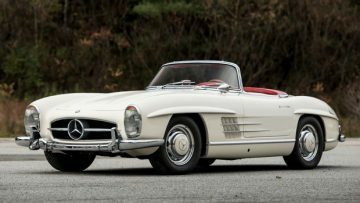 The second 1957 Mercedes-Benz 300 SL Roadster (Estimate: $900,000 – $1,200,000) on offer at Gooding Scottsdale 2019 is an earlier model and has had just three owners since 1963. The car’s second owner spared no expense during a four-year restoration by marque expert Bill Richardson of Richardson Restoration & Machine Werks in Phoenix, Arizona. Finished in its rare original color combination of DB608 Elfenbein Ivory over green leather, the result of the work was such that it won both a People’s Choice Award and First in Class at the September 2012 Mercedes-Benz Starfest National Concours d’Elegance. Presented in stunning, show-ready condition with less than 44,000 miles on the odometer, this outstanding Roadster is ready to grace any of the world’s finest collections. The 1971 Mercedes-Benz 280 SE 3.5 Cabriolet (Estimate: $275,000 – $350,000) has the desirable 3.5-litre V-8 engine with rare floor shift. This big cabriolet is finished in an attractive combination of Silver Grey Metallic over black leather interior and has been extensively refurbished both cosmetically and mechanically. 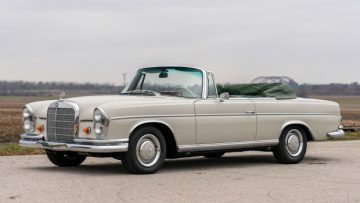 The 1967 Mercedes-Benz 300 SE Cabriolet (Estimate: $250,000 – $325,000) is a rare top-of-the-line model with fuel-injected straight-six, hydraulic suspension, and factory air-conditioning. It is beautifully restored in the distinctive color scheme Weissgrau (DB 158) over a green interior with a matching green soft-top. 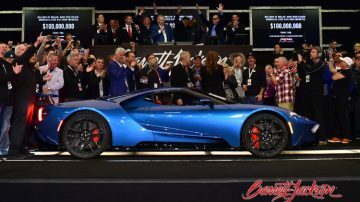 The first major collector car auction series of the year is traditionally the Scottsdale and Phoenix auctions in Arizona, USA, in mid-January. Most major car auctioneers have sales in Arizona including Barrett-Jackson, Bonhams, Gooding and RM Sotheby’s. A notable exception is Mecum that start the auction year a few weeks earlier at Kissimmee in Florida. Barrett-Jackson – 14 Charity Lots, including four Bumblebee Camaros.